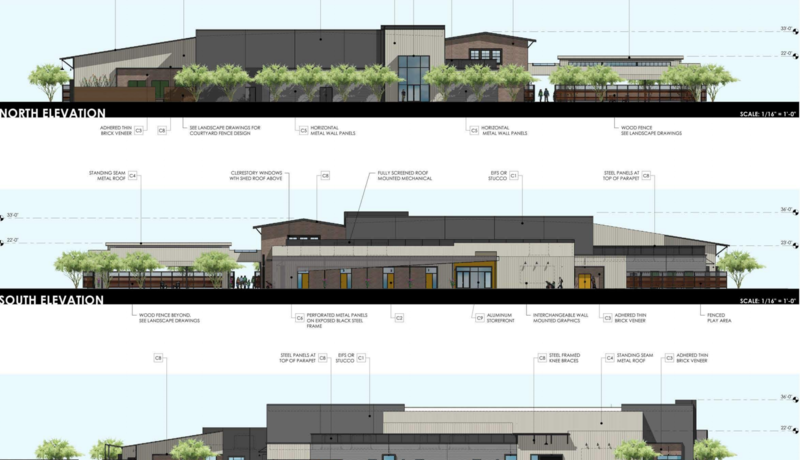 Todd & Associates, Inc. has submitted a request to the Town of Queen Creek on behalf of Rock Point Church to expand on the current Rock Point Church facilities at the NEC of Power Road and Ivy Lane. The second phase of the church building will add 1,400 more seats for the congregation. The Phase II building will also include a nursery and a classroom with an external, fenced play area. Once the new building is done, the existing worship building will be remodeled into a student worship facility, reducing the capacity to around 300-400 seats. In total, the building will have 1,700 and 1,800 seats. The building’s design will feature materials such as perforated metal panels, brick veneer, standing seam metal roofing and aluminum storefront accenting with glass in a primarily grey color palette. The landscaping will match that of the existing site, with trees including Shamel Ash, Chinese Pistache and Chilean Mesquites. The site is bordered by Cloud Road and vacant land to the north. To the south is Casteel High School. Power Road is to the west, and vacant land and Queen Creek Equestrian Estates are to the east. A neighborhood meeting was held in October, and none of the seven attendees expressed any opposition. Queen Creek planning and zoning commission staff recommended approving the request with minor conditions.